Most of today's young generation crowd gets emotionally too attached to 'friends', who they believe, will always be there at times of need, but, isn't always the case. Read the story of this boy who thought the same, which was not the reality. There was something more powerful that got him back on track. Read on! “Having a good education, marks and a job never satisfied me. Living a life where I love what I do and do what I loved is the kind of life I always wanted and today, I’m living my dreams” says Bhaskar N M, currently working at SmartQ, a unique concept that helps to avoid queues that takes hours, at the food courts of Tech-parks. Bhaskar always wished and believed in innovation and creativity, which led him to work with SmartQ. In spite of being called for a job at Amazon, Bhaskar rejected to work for them, since, he knew he did not want to work with a company, where he had to live a machinery life of doing the same work every day. While he waited for an opportunity to work on unique concepts, he happened to meet some amazing set of people who inspired him to work, not just towards his dream but also for the society. This inspired Bhaskar to enroll himself to be a part of the platform that could help him grow and make him socially responsible. “Now is when I got introduced to a platform which gave me a new perspective and new dimension to life, i3-influence,inspire,impact“ he says. Bhaskar got introduced to a lot of entrepreneurs and young achievers from across the globe, who instilled in him, the thoughts to achieve big. With a lot of enthusiasm and excitement, he would listen to every counsellor from whom, he learned to believe in himself. He also executed various social projects impacting and influencing people in his surroundings. Whenever he executed projects, he realized his abilities and understood that he had more potential than he actually thought he did. One of the projects he executed, IUOSB, One Sided Books project, where he collected one sided sheets from various institutes and Xerox shops. These sheets were collected and bound into books which were then, gifted to the children from government schools. 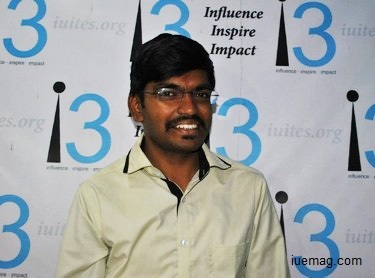 Bhaskar happened o collect about 25,000 one sided sheets in a matter of days and hence was tagged the ‘Delegate of the Week’ at i3, because of the huge inspiration he casted in his surroundings. “Joining i3 is the best decision I have ever taken. It helped me understand the importance of time. I learnt how to plan, schedule and prioritize my work. It showed the importance of mentor in one's life. Finally, it gave me the ability to take my own decisions” he shares about i3 with a pride feeling. His mentors not only guided him to work on projects, but also towards building a good career for himself. “That’s the best part about i3! You are not just guided to work on projects and attend conferences, but you are also taken care of, from all aspects of your life” he says. Bhaskar’s life was not the same when he was a child. He recalls, “I was someone who was always pampered at home and in my school. I was loved for staying calm. There were also people who took advantage of this and tried to trigger me. Singing was something that I loved and I learned singing from my 3rd grade, because of which, I found more interest in cultural activities. I would participate in a lot of competitions in school, but, it was in my 9th grade that my voice turned mature and I was unable to sing songs which had high pitches. That was when my music teacher told that I would never sing well anymore. This was the first ever challenge in my life”. As he continued with his education, he also remembered the words of his music teacher and wanted a chance to prove himself, when, in 12th grade, he happened to be entitled ‘The Best Singer’ from his college. Through this, he learned that nothing is more powerful than the efforts, to achieve anything in life. At the end of his 12th grade, he was depressed. This continued even after he joined an engineering course at East West Institute of Technology, till his third semester. He knew a very few people who would talk to him. Bhaskar was lonely. He started spending more time with himself, introspecting why he was depressed because of others. He became his own best friend. He realized that he depended on others for his happiness and from, then, Bhaskar believed only in himself. ‘I got back the old ME’ he says. He excelled in all that he did and continued to participate in competitions during fests and earned a lot of titles like ‘College Superstar’, ‘Mr. Multitalented’, ‘Best Student of the Batch’ and many more. Now, came the time for Bhaskar to decide on his career. He was unsure if he had to continue in the field of music, or work for a company, or pursue higher studies. Although multiple opportunities reached him, there was a requirement of directions in his life. This was when he got the right directions through his mentors at i3. Being guided by his mentors, Bhaskar is now clear with his goals and visions. He got a chance to work on an innovative idea like SmartQ, where he is given a chance to input his ideas too. “Today I am satisfied by every choice of mine by working in SmartQ. I am very much successful in decisions that I take. This is because of trusting my mentors and believing in myself” he remarks. While he currently works with some energetic people who also encourage him to do better, Bhaskar also believes that he is socially-responsible and hence, makes time whenever possible, to contribute his bit to the society. He also envisions to see more youngsters of the country get the right direction with the help of right mentors. Any facts, figures or references stated here are made by the author & don't reflect the endorsement of iU at all times unless otherwise drafted by official staff at iU. This article was first published here on 9th December 2015.